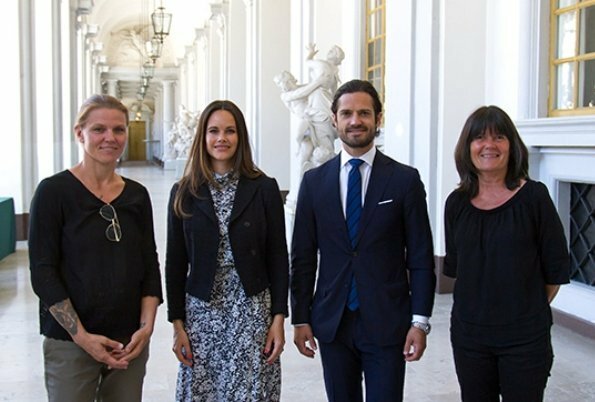 On May 22, Tuesday, Prince Carl Philip and Princess Sofia of Sweden attended a meeting with representatives of National Attention Association (Riksförbundet Attention), that is, Madelein Larsson-Wollnik and Karin Torgny at Stockholm Royal Palace in order to receive information about Nätkoll project of the Association. The purpose of Nätkoll project is to deal with issues relating to people with neuropsychiatric disorders (NPF) via online media between the years of 2015 and 2018. The project aims to enhance the safety of children and young people on online media. Pss Sofia is wearing a nice dress for how much one can see,maybe the next time she wears a white little blazer or almost any color would look nice. I don't understand why some of the princes don't get jackets to fit them. Prince Haakon and Prince Carl Philip are two examples. P CP jacket looks too tight and sleeves too short. Slim fit jackets with shorter sleeves are on trend nowadays. They fit them perfectly. I think Sofia has really grown into her role as a princess. I like her a lot. Her dress looks nice but maybe a white blazer would have been a better choice. I think that the sleeves look too short on Sofia, and a cardigan would have been better. 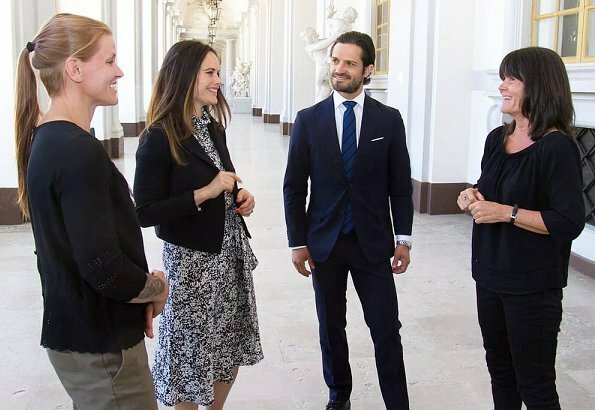 Carl-Philip is in general one of the best dressed princes, I think it is just about fashion to have a slightly tighter fit. But the hair, all that greasy stuff--- Beurk. Tight trousers and 'greasy' hair is à la mode with the boys in Sweden for rather a long time now. So, Daniel, Carl-Philip and all the others grew up with it and for them it is absolutely normal. She managed to find her way; I like that she stays relative modest in her wardrobe choices and yet looks chic. Quel magnifique regard amoureux et admiratif de Carl-Philip envers son épouse! Il est tellement amoureux d'elle que c'en est vraiment touchant! That stringy hair got to go. She is not a juvenile anymore. When she has the Shirley Temple corkscrews I cringe. She has a long way to go before she will become, if ever, a bona fide member of the Swedish Royal Family.